At least 15 people have been injured as Polish and Russian football fans clashed in Warsaw ahead of the teams’ 1-1 draw. Police were forced to fire warning shots and use water cannon to break up the fighting. At least 100 arrests have been made. Some 5,500 Russians were marching through the capital when they were reportedly attacked by a mob of Polish youths. Preliminary reports say at least ten people were injured, and had to be taken to a nearby hospital to be treated for head injuries. At least one of the injured was a Polish national, with no information available on the other two casualties. 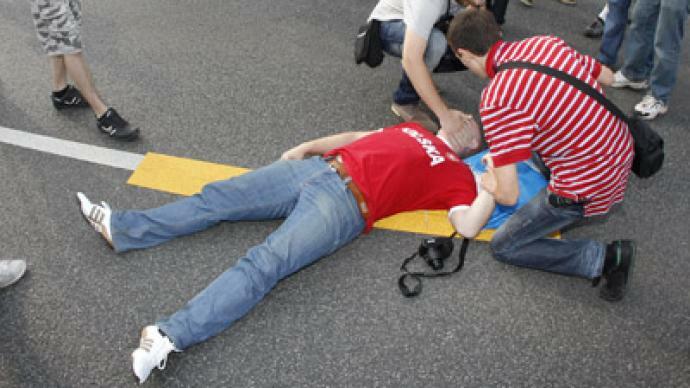 Russian diplomats are checking claims that one Russian fan was fatally wounded. As clashes in the capital continue, local news reports that police are using tear-gas against the hooligans, who in turn are throwing stones and firebombs at the police. 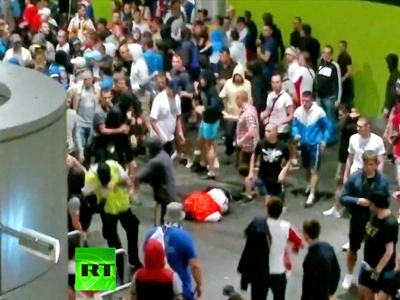 "A hundred hooligans, both Russian and Polish, attempted to provoke a conflict. Police prevented that. Fifty-six people have been detained so far," says the Polish State Police Office. "We are aware of ten casualties: two Russians, one German and the rest are Polish nationals," added the office. Earlier in the day, a mob of some 50 Polish fans attacked a café in central Warsaw where Russian football supporters had gathered before the match. The Polish fans were wearing masks and threw smoke grenades and stones at the cafe. As the Russians fought back, the attackers retreated. One Russian suffered serious head injuries. The Russian fans' march was set to coincide with Russia Day, celebrated on June 12, and had been sanctioned by city authorities.